Seaweed, According to Yunani legend, the symbol of sensual woman, the goddess of love and beauty, was born from a giant seashell, therefore, people believed that sea water can make a person more beautiful and youthful, This can be accepted by the mind, because sea water contains high electromagnetic fields that produce negative ions, and is useful to refresh the mind and good for one's health. Marine vegetation such as seaweed and algae are known to contain vitamins and minerals that are beneficial to boost the metabolism and relaxes the body, Seaweed is believed to have ties to the human body because it has a composition of minerals, vitamins, and water are similar. 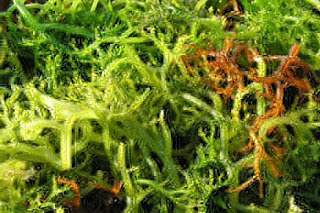 Therefore, the mineral content of seaweed can be very easily absorbed by the skin, To rid the body of toxins and impurities yag make us feel weak and tired, wash with products containing seaweed. Seaweed is rich in minerals, such as magnesium, potassium, and iron that can very well destroy the toxin. Besides seaweed is also useful as an antibiotic, To renew dead skin cells and reduce acne scars or fat in the skin is difficult to remove, can use a mixture of algae extract and peppermint. For optimal results, also use facial cleansers and toners that contain algae. In the market, a mask of seaweed is very diverse. As a practical matter, choose the dried seaweed that have shaped black sheet. If you want to use, dip sheet that has been cut into the water, then put on the face. This mask is suitable for oily skin because it can reduce the mineral content of fat and excess oils. This mask also to attenuate dark spots acne scars on the face.